Jerusalem is the one place where the pilgrims meet, the very heart of the Holy Land. Although Israel as a whole, and Jerusalem in particular, is a beautiful melting pot when it comes to culture and religion, it would take days to explore all the sites and stories related to christianity alone. Thankfully, many christian israel tours are organized in this unique city to help the traveler visit all the main points of interest and leave with a deep and personal experience. Day tours, in particular, are very helpful when it comes to absorbing as much of Jerusalem as possible in a short time. 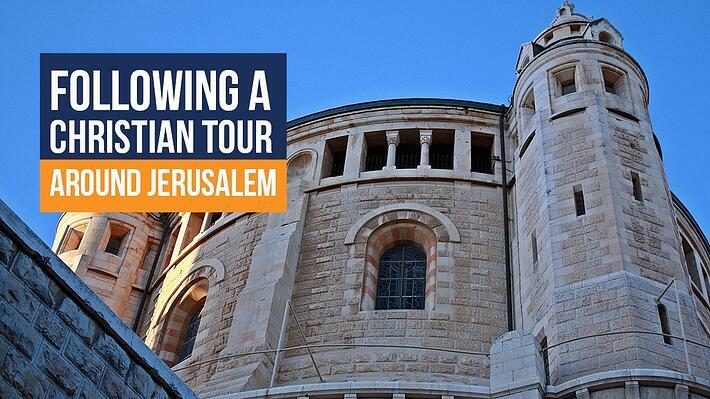 To give you a taste, here are the main things to see on a christian tour around Jerusalem! Stepping into the Old City of Jerusalem is like entering another world. The old stones all around you, the grand buildings, … spirituality is basically pouring from the walls. Today, the Old City is divided into several quarters: the Muslim Quarter, the Christian Quarter, the Armenian Quarter and the Jewish Quarter, each with their very own atmosphere. In the Jewish Quarter, the first thing that grabs the eye of the traveler is the golden « Dome of the Rock » on top of Temple Mount. This is one of the most important religious sites on the planet, and it’s drawing all kinds of pilgrims from all over the world. Take your time exploring the big plaza on top of Temple Mount. This is where Herod’s Temple used to stand, the site of many events in Jesus’s life. A bit further, the Western Wall, also called the Wailing Wall, is a site that always leaves a deep impression on visitors. As you approach, you’ll see that many people still pray by the Wall. The hushed atmosphere gives a really sacred feel to the area around the wall. To fully appreciate the meaning of the Christian Quarter, the best is to enter it by following the Via Dolorosa. This road, also called « Way of Sorrow », is the way Jesus walked between his trial and his crucifixion. The road is marked by nine Stations of the Cross. Many pilgrims walk this road everyday, and discovering this part of the city while walking in the steps of Jesus will give you a lasting feeling of awe! The Via Dolorosa leads to the Church of the Holy Sepulchre, the center of Christian faith in Israel. This church is both where Jesus was crucified, but also where he was resurrected. His empty tomb still lies in the Aedicula, an intimate room inside the church. The main golden altar and the several rooms and chapel connected to the Church of the Holy Sepulchre are all worth a long visit. Just outside the Old City, Mount Zion is a hill with many points of interest. First, it offers a great view on the Old City. Second, it holds the Tomb of David and the Upper Room. The Upper Room is where Jesus ate the last supper with the apostles. Today, the room is bare except for a bench, but it’s not hard to feel the presence of the apostles in this sacred place! On a day tour, you might have to choose between Mount Zion and Mount of Olive. Although Mount Zion is easier to access, Mount of Olives offers a completely different outlook on the city. Situated just outside Jerusalem, Mount of Olives is a peaceful green hill where Jesus liked to walk, rest and pray during his lifetime. This is where Jesus ascended to heaven in the end, making the site a must see for pilgrims. The way up there is a soft climb, well rewarded by the view and the Church of the Ascension standing at the top. At the foot of Mount of Olives lies the Kidron Valley, an archeological treasure opened to the sky. The many tombs sculpted in the yellow stones of the Valley are impressive, but the two main points of religious interest are by far the Church of All Nations and the tomb of the Virgin Mary with its very moving underground altar. At the end of a day tour in Jerusalem, you might feel like there’s still so many things to see and explore in this one of a kind city, and you’re not wrong. The Cardo market, the ramparts, … Jerusalem has many secrets and the only way to know them all is to keep coming back to the Holy Land!